Here’s a little video of my hammock and I swinging gently in the trees. It was so peaceful at Hole Station Adults Only Campsite that I dozed off and, apparently, could be heard doing some Sunday morning snoring in my glade. We were camping on Pitch One, which is now my favourite pitch because it has a secret pathway to a hidden clearing that could have been made for hammocks. 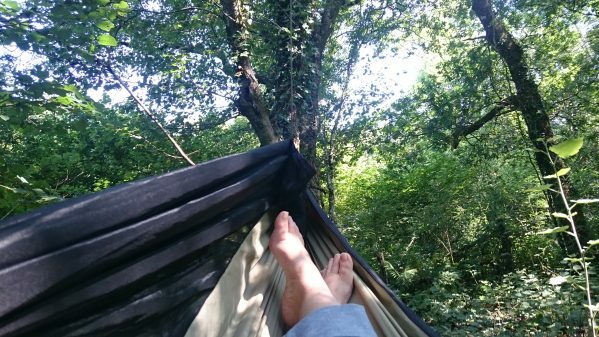 My hammock has now become a vital part of my camping kit and, although I don’t always choose to spend the night in it, I find it a most commodious form of daytime relaxation. Choosing trees in which to hang my hammock is getting easier. They need to be a fair way apart and narrow-trunked enough to allow my tree hugger straps (which protect the tree) to fit around them. A leave no trace approach is as important in a hammock as it is with other kinds of wild camping so I make a point of disturbing as little around me as possible. When I pack up my hammock (always with reluctance) I am just as careful not to disturb things and I always say ‘thank you’ to my chosen trees. Weird I know, but when something is responsible for keeping you off the chilly ground all night, it pays to be polite! I almost went back to sleep over my breakfast watching that. It is a very soporific experience.